These trees rise usually to the Height of about fourteen or sixteen Feet, with a Trunk five or fix Inches thick, from which shoot irregularly its Branches, which are large and succulent, on the Top of which are placed the Leaves and Flowers. The Leaves grow many of them together, they are about seven or eight Inches in Length, and two or three broad, of a shining Green, The Flowers are tubulous, and are divided into five Segments; they are of a Rose Colour, and very fragrant. The Seeds are contain'd in a double Pod, like the Rest of the Neriums. 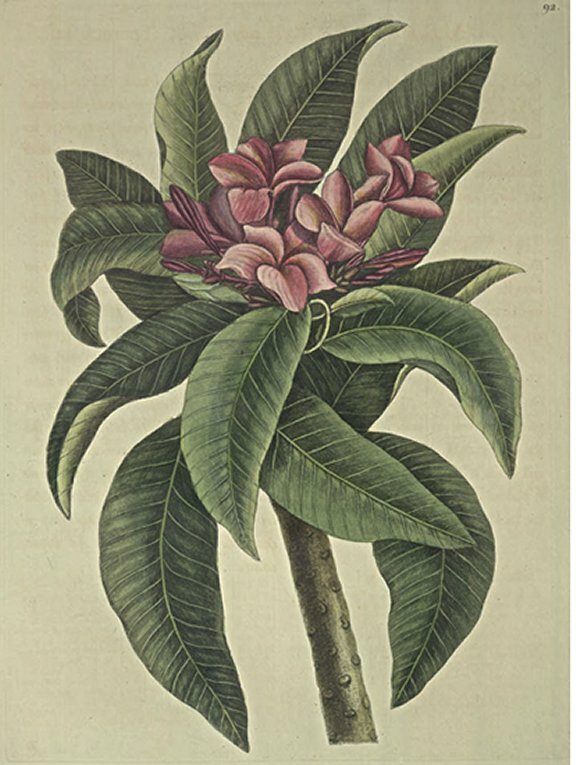 This elegant Plant was at first introduced from the Continent of America to Barbadoes, and other of our Sugar Islands, where it is planted in Gardens, and in great Esteem for its Odour and Ornament.